Well, I’ve shared it a couple times, just not yet on this blog so here goes. Do you have a party or potluck coming up? Perhaps a special someone’s birthday, graduation, etc.? Or do you just want an excuse to enjoy something decadent yet refreshing, sweet yet with a hint of savory, creamy & mellow yet also tangy? These cookies fulfill all of those needs. I’ve made them for potlucks, block parties, birthdays, congratulatory gifts & just for the heck of it. Every time I make them, I get the highest of compliments. The looks on people’s faces and the sounds they make are so worth the effort spent making these. I’ve probably gotten more joy from seeing people experience them than actually eating them myself. Well, that might be a small lie, but you get my drift. Be advised, these are a labor of love and are best served the day after they’re made–so worth the work & wait! Even the ingredients & special tools needed for this are a thing of beauty. Note my very favorite kitchen utensil at the bottom. 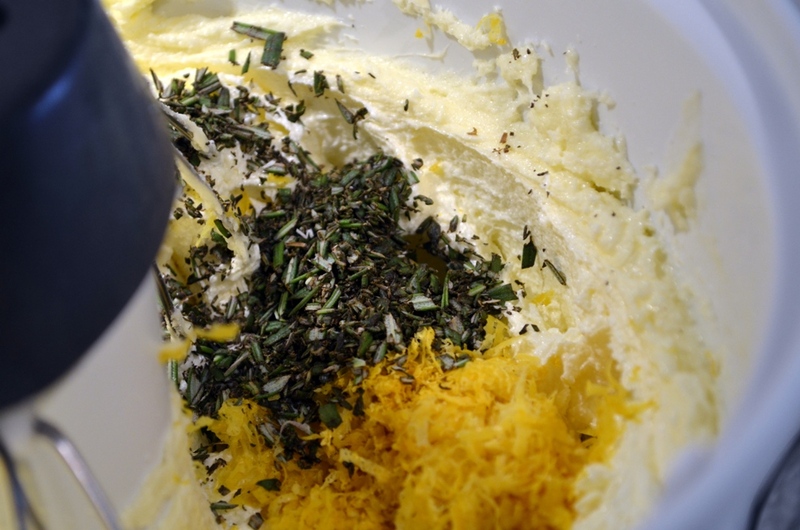 Whip butter until creamy, then add sugar, rosemary & lemon zest & whip until creamed together. 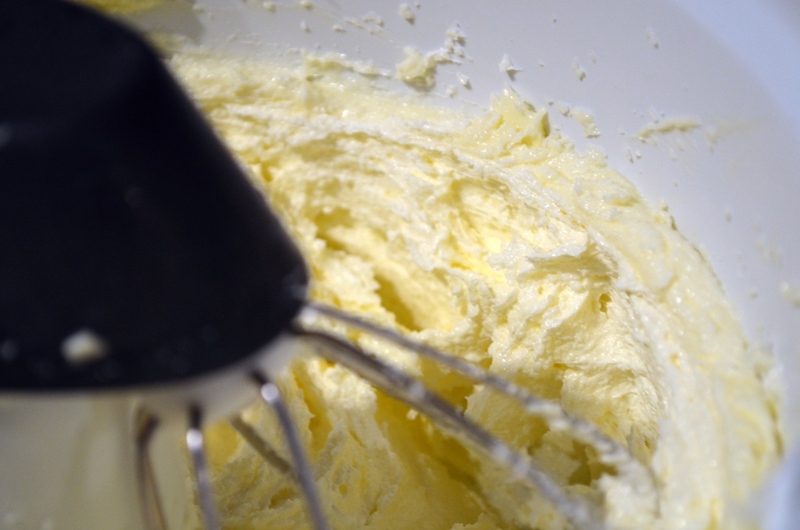 Butter should be whipped to the point of turning white. Cream-eh! Thanks, Old Greg, for hijacking my brain with that word. Whisk dry ingredients (baking powder, salt & flour) together in a bowl, then mix into wet ingredients adding 1/3 of dry mix at a time. Take care not to overmix or the cookies will be tough. 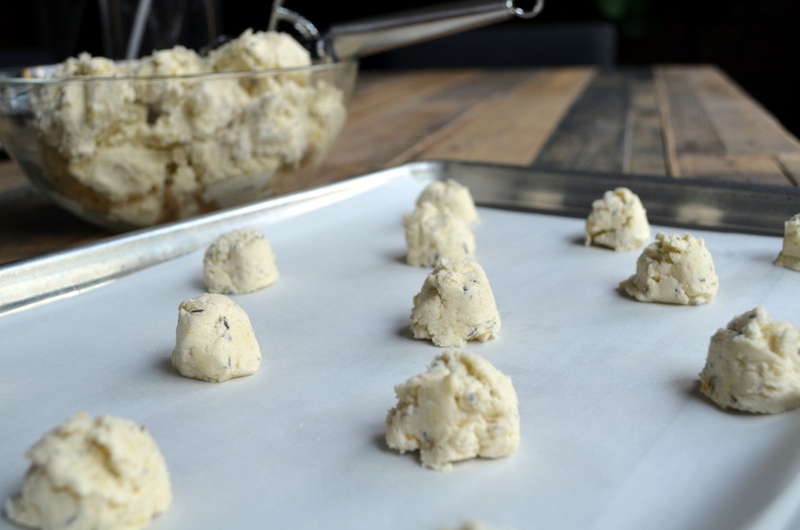 Shape dough into 1″ balls and set a couple inches apart on sheet trays lined with parchment paper. Then, gently squish each ball with a glass dipped in sugar to about 3/8″ thickness. Bake about 8-9 mins or until lightly golden. Cool for a minute or two, then transfer to cooling racks. While cookies are cooling, mix the creme by simply stirring the lemon curd and mascarpone cheese together. Once the cookies are completely cool, spread a bit of the creme on the undersideof one cookie. 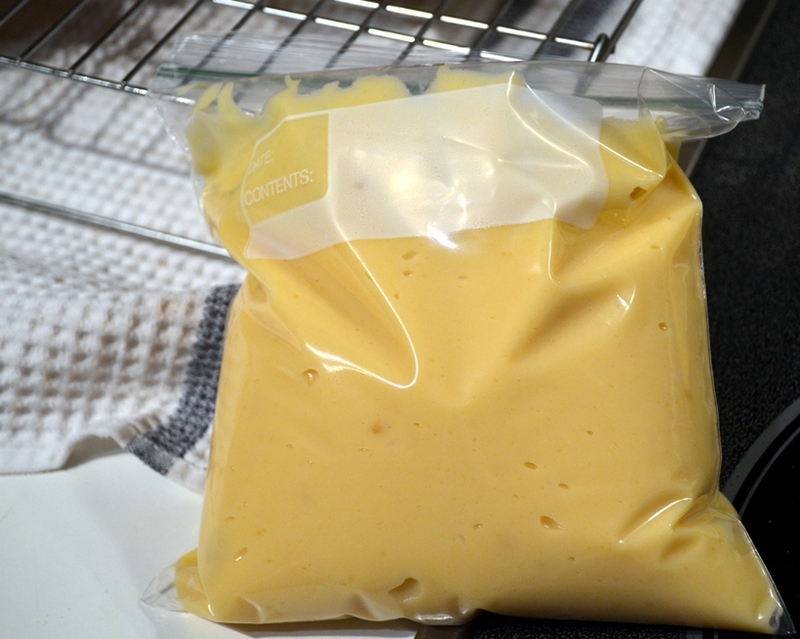 I like to put the creme in a zip-top bag and cut a tiny piece of the corner off and use that like a pastry bag to squeeze the creme. Top with another, underside to the creme to make the perfect sandwich. I find it best to let these sit overnight or for an entire day before serving. 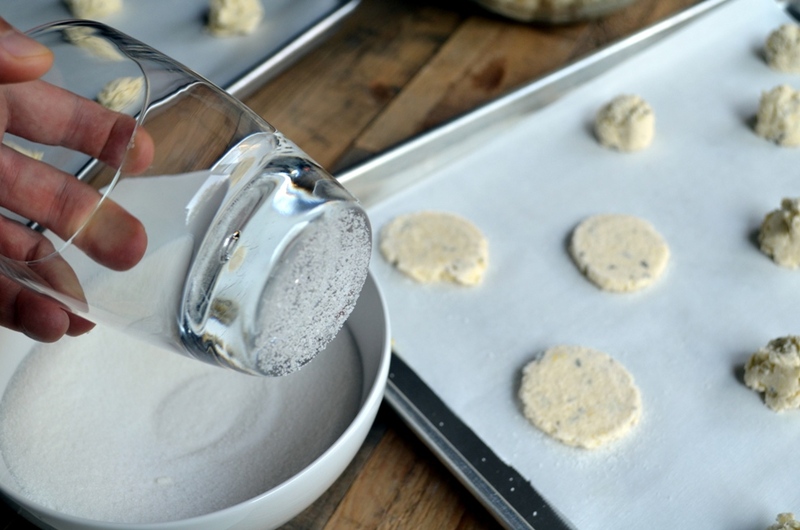 That allows the creme to soften the cookies and they’ll nearly melt in your mouth when they reach room temperature–if you can wait that long. I’d also imagine these would be great with lavender, thyme or even pink peppercorns in place of rosemary. 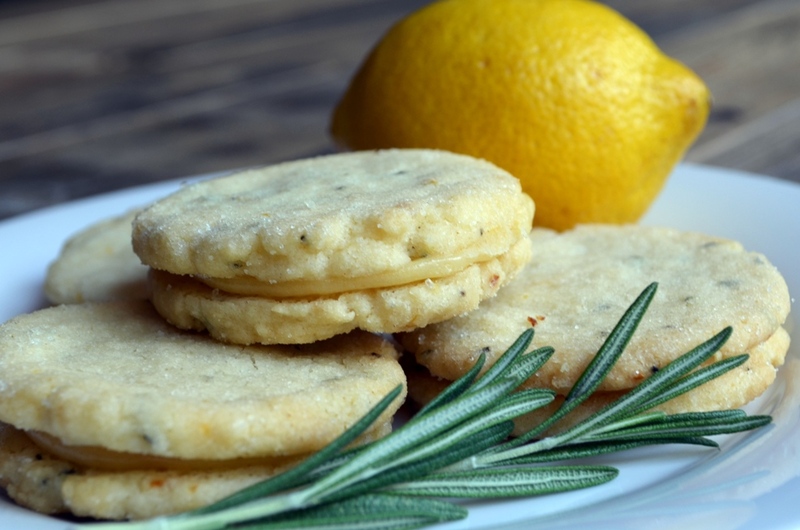 Also, the next time I make these, I’m going to add tiny sprinkle of salt on each cookie before baking them to cut some of the sweetness and bring out even more of the lemon & rosemary flavors. Lastly, since they’re a bit of work and the creme ingredients aren’t the most common, make a double batch. They freeze perfectly well and I promise you’ll go through them faster than you anticipate. Tell me if you make these. And if you change them up, please share your ideas. These look so light and tasty! A perfect way to end the summer! I’d have to agree, Danny! 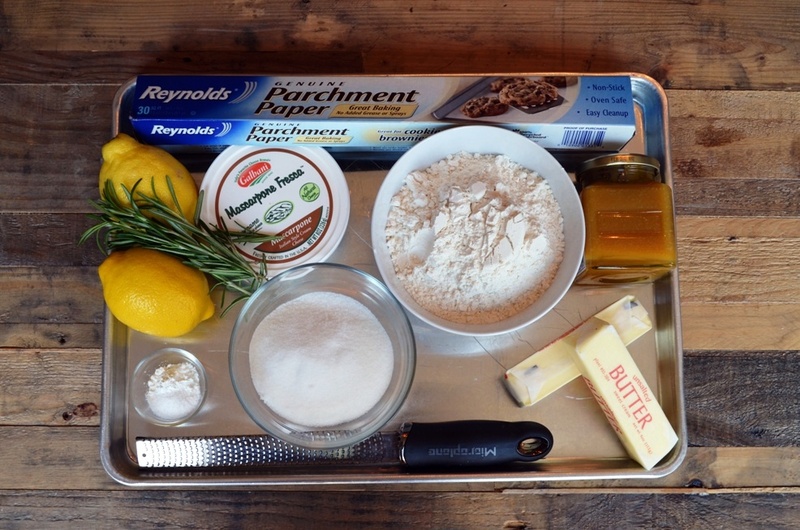 I’m a big fan of lemon curd and rosemary, too. Your photos are great in this post. If only I could transport those cookies through my monitor screen. 🙂 Thanks so much for stopping by my blog. It’s nice to know I’m part of a larger writing and cooking community. Cheers! Wow…those sandwich cookies look to-die-for! I have a sandwich bag-full of local rosemary that I need to do something with. Yesterday I baked a peach rosemary upside-down cornmeal cake, but one tablespoon later, it hardly made a dent in my rosemary supply. I think I spy a weekend baking project. Love your photos too! Ooh, that cake sounds excellent! I hear you on not being able to use the rosemary up. Our plant is huge now, but I think I might freeze it chopped up in olive oil inside ice cube trays for use through the winter/early spring. I have lemon curd to use up, this sounds perfect. 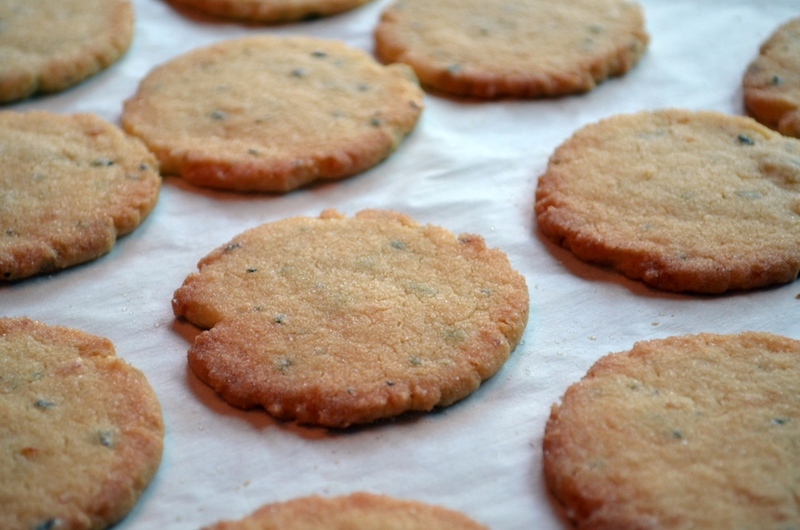 You said they freeze well….are you referring to a filled cookie? You can absolutely freeze filled cookies. They’re perfectly moist upon thawing. Just be sure they stay refrigerated once thawed on account of the mascarpone.